Is this dark knight in black satin a shredder’s delight? The M-Jet sounds great and plays better, and if you set aside some finishing flaws, you have a serious guitar at a cheerful price. Great price, build and sound. The latest electric from Manson Guitar Works is built by Cort under licence in Indonesia but it looks as though the Pentagon might have had a little design input, too. It’s called the M-Jet and it comes in a matt Dry Satin Black finish that wouldn’t look out of place on a Stealth Bomber. On a guitar it just adds weight to the suspicion that the Cort/Manson alliance could have a big say in the market for weaponised electrics at a mid- range price point. 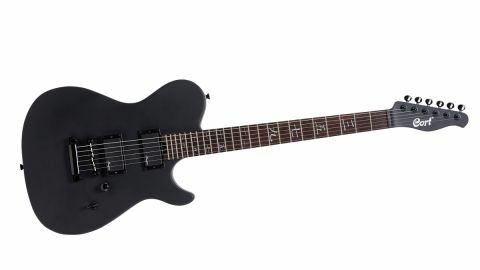 The M-Jet is no Matt Bellamy signature model, but its closest kin, in terms of price and spec, is Cort/Manson MBC-1, an affordable take on Bellamy’s own signature electric. The MBC-1 similarly has a basswood single-cut body and super-svelte neo-T-style headstock, but, featuring a kill button and pairing a Manson humbucker and single-coil in bridge and neck respectively, it’s a very different beast. Take the M-Jet’s MA body profile... It has a more subtly rounded lower horn than the MBC-1 and seats two newly designed high-output humbuckers. They are house specials, so to speak, designed by Manson, but promise a similar sonic footprint to, say, an EMG H4, a red-hot passive ’bucker and top-seller for EMG. In another departure for Manson, the M-Jet deploys a 24-fret neck, cut from Canadian maple with a satin-smooth finish. Its rosewood fingerboard marks the frets in Chinese, while a compound radius, ranging from 12 to 15.75 inches, is but one factor in making it such a playable instrument, offering a comfy seat for rhythm playing and rewarding a lighter touch for leads. Indeed, the M-Jet is all about tone and feel. The M-Jet is an incredibly tactile instrument that’ll help you find your tone with a minimum of fuss. All the hardware is black, naturally. There’s no pickguard. A sturdy two-piece bridge and tailpiece makes for quick string changes while a set of locking tuners is a nice touch at this price, and offers those with a real physical style a little assurance that Herculean string bends won’t throw the tuning all out of whack. The neck, too, is a crowd-pleaser - a Goldilocks profile. For comfort/speed it’s somewhere right in the middle, but that satin-smooth finish will add a little zip to your lead playing, with no high gloss to glue sweaty hands to the neck just as you’re about to unleash some killer legato. When you hear the M-Jet’s Manson-designed humbuckers in full flow you can imagine the high-fives in the Manson R&D bunker after they debuted them. The neck humbucker is sharp, aggressive and punchy. There’s a lot of midrange power there but it has a trebly snarl and brilliance. In clean tones, that bright snap feels like it’s pushing itself to the edge of breaking up. As you dial in more gain, that treble voices itself in a sinewy AC/DC crunch, and in the throes of high-gain mayhem, which, let’s face it, is how many of us like to spend our time, the bridge ’bucker is a true gnarly street fighter, heaps of fun, with harmonics on-demand. The neck humbucker is similarly powerful, but makes a welcome contrast, especially when there is no tone control. With clean tones it’s responsive and natural, great for blues and those moody Em add2 chords that Metallica, FNM, et al love, but with the gain in the feral position it makes for an incredible rhythm tone, a little grungy, a little nasal, but still bright and lithe. Select both pickups and you have the best of both worlds, but in a guitar pitching itself to extremists, choosing the neck or bridge feels like a binary choice. Enjoy it, because what Cort/Manson have done here is made your guitar procurement decision that bit more difficult. In a marketplace crowded by high-powered electrics aimed at the black t-shirt demographic, yet another convincing performer can only add to the sense of option paralysis any rock or metal guitarist feels whenever they walk into a guitar store.